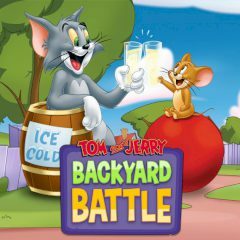 Tom and Jerry will do this outside the house not to destroy everything. Use a launcher and hit your opponent. Tom and Jerry will see who is a better shooter. Go outside, keep the distance and use a launcher to deliver wrecking balls to your enemy. Can you get it straight five?